Peripherals specialist Tesoro has showcased a range of existing and upcoming gaming peripherals at Computex 2018, including keyboards, mice, and gaming chairs. On the keyboard front, the Gram family will get a few additions. One of these is the Gram XS – admittedly, this is already available to buy, but we wanted to draw your attention to it since we have a review forthcoming and also just completed a pretty sweet mod that Tesoro was kind enough to show off at Computex. 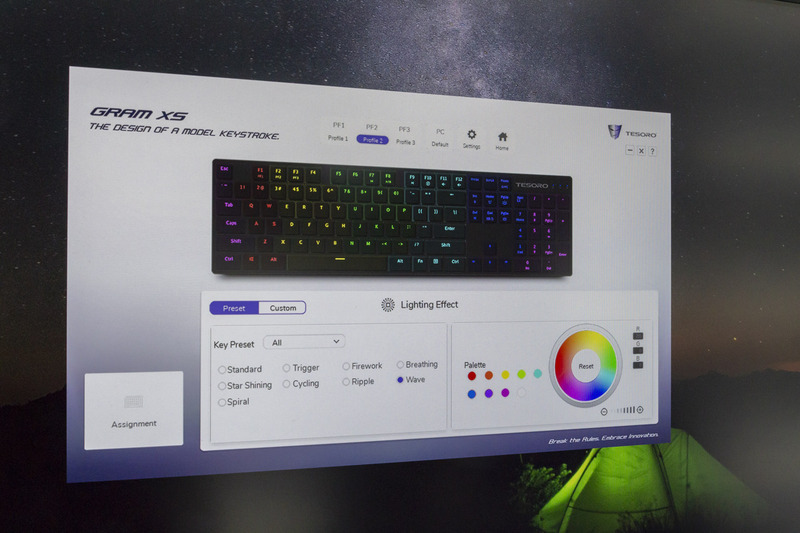 The Gram Spectrum TKL, pictured above, is pretty self-explanatory, taking the existing Gram Spectrum design and turning it into a tenkeyless one. It will carry a retail price of $99 and will be available in both black and white. The Tesoro Gram MX One fuses the Gram design with Cherry MX switches, specifically Brown and Blue. Again, this keyboard will be available in both black and white, each with single-colour blue LED backlighting. The unit also benefits from a steel plate and a detachable USB cable, and it will retail for $79. The Durandal Gen X is a more premium offering set to launch in Q4 for $150. This full-size keyboard has a steel plate, a magnetic wrist rest, and uses Cherry MX Speed Silver switches. It also offers a dedicated volume wheel and mute button, USB 3.0 pass-through functionality, and it will be compatible with the Tesoro 360 customisation software. We had a quick look at some forthcoming gaming chairs from Tesoro. The entry-level F700 Zone Speed is designed for gamers with a smaller frame; in fact it’s one of the smallest gaming chairs we’ve seen. It will have black, white, and red colour options and cost $160. The F750 Zone X, meanwhile, is decidedly larger and nearly double the price at $300. This chair will be available in black with either purple or gold coloured stitching. Finally, we saw the Sagitta V2 gaming mouse, which will be ready in about two months and cost $60. It’s a right-handed design aimed at claw and palm grip users, and it sports six programmable buttons, RGB lighting, and a soft-touch finish. Omron switches and a 12,000 DPI sensor round out the package.